In the same year, December 13, 1733, the Grand Lodge of England at its Quarterly Communication in London adopted a resolution to "collect the Charity of this Society towards enabling the Trustees (of Georgia) to send distressed Brethren to Georgia where they may be comfortably provided for...that it be strenuously (sic) recommended by the Masters and Wardens of regular Lodges to make a generous collection amongst all their Members for that purpose..."
Some three months later, February 21, 1734, a Lodge of Freemasons was organized at Savannah under the "old Customs" (without warrant). Noble Jones, intimate friend of James Oglethorpe, was initiated on that date, the first Freemason made in Georgia. On December 2, 1735, the Lodge was warranted by the Grand Lodge of England and entered on the engraved list as "The Lodge at Savannah in Ye Province of Georgia". It was assigned number 139 on the register of English Lodges. By 1770 its number had been reduced to No. 63 and by 1792 it was No. 46, although no longer an English Lodge. The Lodge at Savannah changed its name in or prior to 1770 to Solomon's Lodge. In 1774 and 1775, respectively, the Grand Lodge of England warranted two more Lodges in Savannah, Unity No. 465 and Grenadiers No. 481. Both Lodges died an early death. Except for that brief period, Solomon's Lodge was the only Lodge in Georgia from 1734 until 1785. Solomon's Lodge was the second duly constituted Lodge in America, next only to a Lodge in Boston warranted in 1733. Solomon's Lodge is the Mother Lodge of Georgia. Serving as Provincial Grand Masters in Georgia were: Grey Elliott, 1760 until he was succeeded in 1771 by Noble Jones. Brother Jones served until his death in 1775. Sometime during the War for independence, Samuel Elbert, American soldier and later Governor of Georgia, was "elected" Provincial Grand Master. On December 15, 1786, Brother Elbert resigned as Provincial Grand Master so that the independent Grand Lodge of Georgia might be formed. A group of dissident Freemasons in Savannah, disapproving the workings of Solomon's Lodge, petitioned the Grand Lodge of Pennsylvania in 1784 for a charter to organize a Lodge. 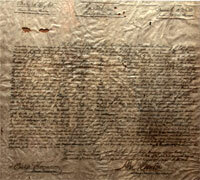 Their petition was granted by Pennsylvania on March 31, 1785, the Lodge being listed on Pennsylvania's register as no. 42, to be known as Hiram Lodge, Savannah, Georgia. In the true spirit of Freemasonry the differences between the two Lodges were soon reconciled. In the following year it is known that two additional Lodges existed in the state, one at Augusta and one at Washington. It is believed these four Lodges, on December 16, 1786 met together and created the most Worshipful Grand Lodge of Free and Accepted Masons for the State of Georgia. William Stephens, Past Master of Solomon's Lodge, now No. 1, and the first U.S. Court Judge in Georgia, was elected and installed Grand Master. The next eight Lodges in Georgia were: Columbia No. 3, Augusta; St. Louis No. 4, Washington; Washington No. 5, Washington; St. John's No. 6, Sunbury; Little River No. 7, Little River; St. Patrick's No. 8, Waynesboro; St. George's No. 9, Kiokas; Union No. 10, Savannah. With the exception of Solomon's No. 1, all of the above Lodges are extinct. Social Lodge, originally No. 18, Augusta, Georgia, now also No. 1, was chartered in December, 1799. Georgia has 451 Lodges and 72,451 members (as of October, 1997). The Grand Lodge of Free and Accepted Masons for the State of Georgia was incorporated with perpetual duration on February 6, 1796, by an Act of the General Assembly of Georgia passed for that purpose, and has been delivered down to the present day. Rising Star F&AM Lodge of Eatonton, GA was chartered in 1818 with George M. Walcott serving as the first Worshipful Master. The first Lodge cornerstone was laid in 1820 as Lodge #33. Today Rising Star is the 4th Oldest Lodge still active in Georgia. The Solomon's Lodge in Savannah was the first Lodge in Georgia started by James Oglethorpe Founder of Georgia. Rising Star #4 was chartered as lodge #33 in 1818, in 1820 changed to #10, in 1829 #7, and in 1838 to #4. Original cornerstone which was thick enough to cut into 2 other slabs, enscribed and laid in the building of the present lodge. Original charter issued on October 20, 1818. Come back often as we update the lodge history!